I have always relied on Consumer's advice when buying major household items, however I have sometimes found their recommended buys don't live up to their status. 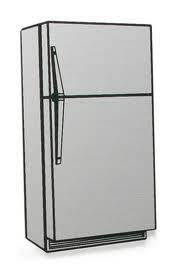 The fridge we bought some years ago was a recommended model and yet we have been plagued by fluctuating temperatures and during Summer the fridge often turns into a freezer. When I pulled out our first cucumber of the season to use in a sandwich and found it was frozen solid, it was the last straw, especially after the strawberries I had picked the day before were in a similar state when I tried to put them on my breakfast cereal. Over the last few years we have had a succession of appliance specialists come in to try and fix the fridge and this time I decided that another costly repair (the fridge is well out of warranty) wasn't worth it, the fridge would have to go! I did look at the Consumer website, but rather than just going for their recommendations I also read the reviews that owners of the various models had submitted and these were interesting. It turned out that the fridge I would have bought, had I followed Consumer's advice, was not well supported. It was very noisy, had problems with the doors and one owner had had to replace a fan. A fridge that scored the second lowest, on the other hand, had many positive reviews and closer analysis showed that the area that we cared most about (adjustment to seasonal changes) was something this fridge was particularly good at. I was concerned that it did not score as well as the best fridge for energy consumption, but again when I compared the actual data the difference turned out to be negligible, I didn't think 90 cents difference for running costs per month was significant. "Generalised headings now for testing does not help the consumer. Previous testing was under headings that a consumer could assess suitability, such as; are vege and fruit kept crisp in crispers...can't do that now." Consumer provides also their own value to each criteria but perhaps rather than use their own priorities for ranking products they could just list the criteria scores and allow members to give their own weighting for each area. The new fridge has been bought and delivered and is purring away quietly in its allotted place in the kitchen (it was also one of the quietest of the models) and I guess a few months or years will prove the wisdom of our choice.